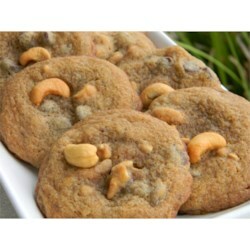 "This cookie has whole cashews and chunks of chocolate." Bake for 10 to 12 minutes, or until lightly brown. Pretty good. Used 3/4 cup butterscotch chips and 1 and 1/4 cup semi sweet chips. Liked cashews in it. These are quite good! My husband's coworkers loved them. I used Nestle chocolate chunks. Very quick to mix together. These were just OK for me, I used coarsely chopped milk chocolate instead, and I used chopped walnuts as cashews are kind of bland. these cookies are easy to make i did not put in cashews though they were pretty funky tasting but that is my fault ( to much vanilla extract) but 5 stars!